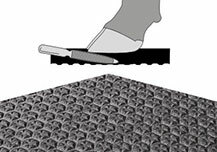 20 % with soft-abrasive pediKURA® mats. The Hirl family covered the walking areas with KURA P from the beginning. In 2009 20 % of the walking areas were retrofitted with pediKURA®. 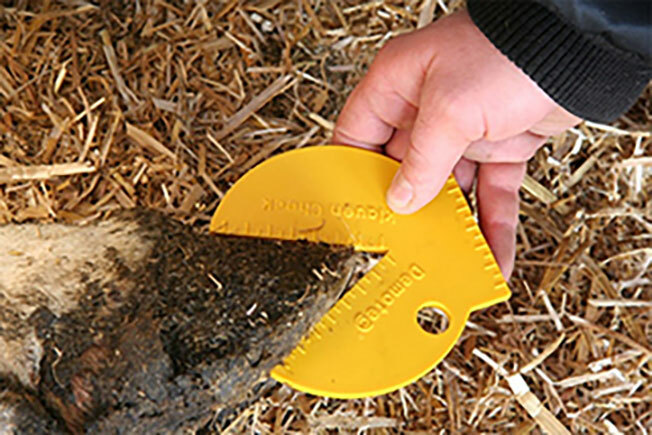 The best place for these mats was in the areas in front of the milking robot and the crossing passages. So far the farmer and his claw trimming specialist are very satisfied with the results. Claw health has improved even more since installation. The dorsal wall angle is almost the desired 45 - 50°, even a while after claw trimming, as the picture shows. "In the new cubicle house (2009), we installed KURA P and pediKURA® in the crossovers. According to our claw trimmer there is not more horn growth. Claw trimming is now more prophylactic, i.e. done for checking the claws." After the enlargement of the cattle house in 2009, the pediKURA® system was installed at Mr. Feitzinger's farm. 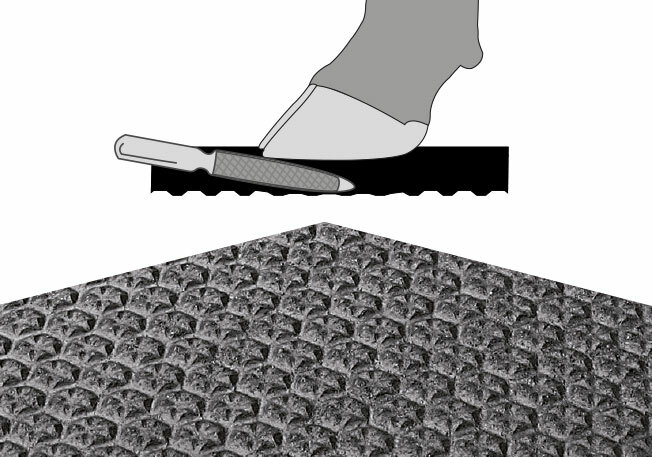 The farmer observed that there are fewer side wall defects on the claws and that claw trimming goes faster. Since a new foot trimming box had to be bought recently, the claws are currently only trimmed when required. However, the claw form is almost ideal. In 2000 the cows moved into the newly constructed cubicle house. The slatted floor was covered with the first KURA S variants. The latest variant has been in the cow house since 2006 and the system pediKURA® S was retrofitted as well. "Since we also retrofitted with pediKURA®, it has had a beneficial effect on claw abrasion. Now we have the claws trimmed every 8 months, where before the claw trimmer came to our farm every 6 months." check the claws with the KRAIBURG pediKURA® Tester!